Are you bulking? Muscle meals ideal for men who want to gain muscle mass. Gaining muscle has as much to do with what you do in the kitchen as what you do in the gym. You’re not going to achieve the fast muscle mass gains you want unless you follow a mass gain diet that provides an ideal balance of macronutrients at every muscle building meal. 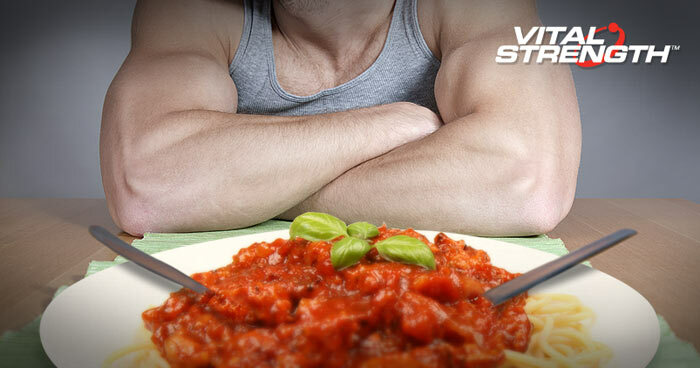 Don’t let your hard work in the gym go to waste by skimping out on nutrition. These top 7 muscle gain meals for your bulking diet plan not only taste delicious but are also packed with proteins, complex carbohydrates and good fats to fuel muscle building and mass gain. Variety is the spice of life – and gains. Some guys may be happy eating chicken breast and rice day in and day out, but bulking doesn’t have to be boring. When you have to eat several times throughout the day to reach your mass gain goals, the last thing you want is to be dreading your next meal. Variation and experimentation keep food fun, and stops your diet from becoming intolerable. Forget working out your gag-reflex and add these 7 recipes into your clean bulking program to build muscle without sacrificing on taste. >> GET MUSCLE FAST. Read more muscle articles here. These muscle meals for your bulking diet plan are designed to help you get into a routine of preparing muscle building meals so that you will gain quality muscle mass faster. Muscle meals for men who want to gain mass and build muscle faster. 1. Prepare rice noodles according to packet instructions, drain and set aside. 2. Heat oil in a wok, add onion and cook for 1 minute, add the garlic and cook for a further 30 seconds. 4. Add broccoli and cook for 1 minute. 5. Add noodles and sauces and heat through. 6. Combine and then serve. 1. Preheat oven to 200deg. 2. Place potatoes into a lined roasting pan. Spray with a little oil. Season with salt and pepper. 3. Roast for 30 minutes. 4. Rub chicken with seasoning and a little olive oil then add to roasting pan. Roast for a further 15 minutes, or until chicken is cooked through. 5. Serve chicken and potatoes with beans. 1. Heat oil in a large pan, add onion and garlic, cook over a low heat for around 2-3mins. 2. Increase heat and add turkey mince, cook for 1 minute, breaking up any lumps. 3. Add carrot, zucchini, beans, tomatoes, tomato purée, water, herbs and seasoning. 4. Bring to the boil then reduce the heat, and simmer for 20-25mins. 5. Cook around 100g-150g of the spaghetti per meal according to instructions on the packet. 6. Drain well then transfer to a serving bowl, spoon over the bolognese sauce and serve with freshly grated parmesan. 7. Freeze or refrigerate remaining Bolognese mix for other meals. 1. Marinate steaks in 2 tablespoons of balsamic vinegar for 15 mins in fridge. 2. Place sweet potato in saucepan on stove and cover with cold water, bring to boil and cook for 10 minutes or until tender. 3. Drain and mash with garlic, set aside. 4. Combine tomato, avocado, onion, salad greens and remaining vinegar in a separate bowl . 5. Heat a frying pan over medium high heat and lightly spray with olive oil, cook steak for 2 – 3 minutes each side (med rear). 6. Remove and rest for 5 min, covered with foil. 7. Serve steaks with, sweet potato mash and salad. 1. Preheat oven to 180 deg. 2. Steam sweet potatoes until soft. 3. Mash with milk and butter until smooth, season with salt and pepper, set aside. 4. Heat olive oil in a pan over medium heat. 5. Add the onion, garlic, and carrot and cook until soft. 6. Add the mince and beef cube and cook until the meat is brown. 7. Stir in the tomatoes, tomato puree, thyme, rosemary, garlic, oregano, pepper and worcestershire sauce. 8. Add mixture to an oven proof dish and top with sweet potato mixture. 9. Bake in oven for 20-30 mins. 10. Split dish into 4 meals. Serve with steamed green vegetables. 11. Freeze or refrigerate left over’s. 1. Heat oil in a large frying pan over medium-high heat. 2. Add onion and cook, for 2 to 3 minutes or until softened. 3. Add capsicum, corn kernels, tomatoes, tomato paste, beans and tabasco. 4. Bring to the boil. 5. Reduce heat and simmer for 20 to 25 minutes, or until heated through. 6. Preheat oven to 200°C. 7. Place corn chips on heatproof serving plates. Spoon over bean mixture. 8. Sprinkle with cheese. Bake for 5-10 minutes. 9. Serve topped with avocado, lemon juice and a dollop of thick natural yoghurt. 2. Cut each sweet potato in half lengthways, then cut each half lengthwise into 4 thin wedges. 3. Place in a roasting pan and sprinkle with paprika and salt. 4. Drizzle with 2 tbs olive oil. 5. Roast, turning occasionally, for 20 minutes or until golden. 6. Meanwhile sprinkle fish with salt and pepper. 7. Mix sesame seeds and flour on a plate and dip each fillet in the seed/flour mix, pressing the seeds gently into the fish. 8. Lightly spray fry pan with olive oil and cook on med-high heat for 1 1/2 minutes each side or until golden. 9. Serve with steamed asparagus. Muscle Meals tip for your bulking diet: If you don’t have a solid muscle gain meal plan in place then you’re more than likely not going to get the muscle mass results you work so hard for in the gym. These muscle meal ideas for your mass gain diet are designed to help you get into a routine of preparing muscle building meals so that you will pack on quality muscle mass faster.